Specialising in authentic Australian Aboriginal Fine Art since 1996. Visit the Gold Coast's most hidden art space. 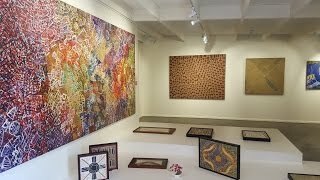 They have a large collection (over 450 square metres) of collectable and quality paintings by significant Aboriginal artists. There is also a wide variety of small and large very affordable original paintings available to select from. The gallery and studio are located in Southport (Gold Coast) and it is open the public, free of charge, please check their website for the opening times. Member of the Australian Aboriginal Art Association and Indigenous Art Trade.